In a commercial building a wide range of individuals will need to gain access on a regular basis creating considerable risk when it comes to ensuring the security of the premises. The cost of full time security or reception staff can be great, which is where the installation of a master key system can provide a simple and cost effective security solution. These systems enables everyone with a “master key” access to the building when they need it but without compromising control of who gains access to what areas and when. Master key systems are most commonly used by businesses, offices, schools and residential facilities such as apartments and dormitories. They are also a favourite with landlords of multi-occupancy buildings and student accommodation. The main benefit of a master key system is that each individual can be issued with the same key but each one will have a pre-set level of access to different areas of the building as required and as set by the manager of the system. For example an individual student could have access to common areas but only their individual bedroom or dorm, whereas, the building manager could have access to all areas. This versatility and flexibility simplifies not only access but also the organisation of issuing and managing different keys making it a convenient and cost effective solution to access control. Looking for assistance with the management and control of access into your office, school or student accommodation? Give us a call on 0117 9674994 or alternatively see a selection of our Master Key Systems below. All of our master key systems can be installed as a single operation or in phases, which is often the case for existing buildings. 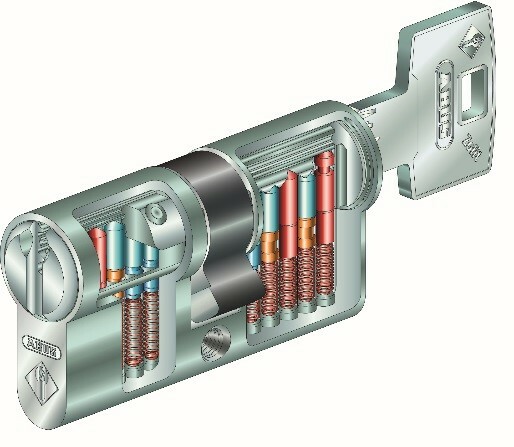 The current system designs make lock-picking virtually impossible, so despite the potential for a large number of keys being able to access a single lock, the number of reported break-ins involving cylinder lock picking is extremely small. For more information when choosing the right Master Key System for you, speak to one of our experienced security specialists on 0117 9674994. You can also find further help on our FAQ and blog pages.